Yes! Greyhounds make great pets, they are quiet, well mannered, and very easy to live with. They are friendly, lazy, calm, affectionate, clean, loving, trusting, good-natured and very social. Why should I adopt a greyhound through Greyhounds as Pets WA? Do greyhounds adjust quickly to pet life? Yes. Greyhounds are fostered by GAP for four to six weeks to expose them to as many new experiences as possible. Evaluation of the greyhound as a companion animal is an important part of helping GAP to ensure that the right dog goes to the right home. Foster carers introduce their greyhound to new things like vacuum cleaners, glass doors, stairs etc. Remember that life in a racing kennel environment is a relatively sheltered existence and your home will offer many new experiences for most greyhounds. Do they need a lot of exercise or room? Contrary to what a lot of people think, greyhounds are more like sprinters rather than marathon runners. This means that most of them only require a 15-20 minute walk each day. Many can sleep for up to 20 hours a day so are great for families and busy working couples. However there are exceptions to the rule and some greyhounds will require more or less exercise dependent on their energy levels and age. As a large breed of dog, greyhounds actually require much less room than other breeds of a similar size and will often be found curled up around the house. We have greyhounds living in studio apartments, units and townhouses, as well as large homes and rural properties. They are well suited to most environments. Do greyhounds have to be muzzled in public? If you are fostering to adopt or fostering a greyhound you will be issued a wire muzzle. Unless your greyhound has received a Green Collar from GAP, they must wear a muzzle at all times in public areas, including when on walks. 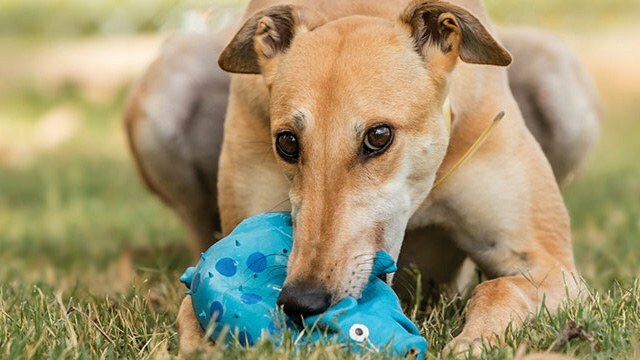 Greyhounds can only receive a Green Collar once they have officially been adopted from GAP. Therefore, this means any greyhounds that are in foster must wear a muzzle in public, even if you are fostering to adopt. Can I let my greyhound off leash? No, by law greyhounds must be kept on leash in all public places. Your greyhound will be issued a Green Collar making it exempt from wearing a muzzle in public, however it is still law for all greyhounds to be kept on leash in public places – this includes off leash dog parks. Greyhounds are sighthounds and are very fast, even a greyhound with great recall can see something in the distance and run off to reach it. A sighthound in chase mode can easily run onto a busy road or through a fence without realising the danger. Therefore, for the safety of your greyhound and in keeping with Western Australian law please keep it leashed at all times. Will my greyhound be toilet trained? Most greyhounds do not come toilet trained. However, they are generally very clean dogs. Living in a kennel environment, most dogs do not like to soil in their sleeping quarters, and will wait until turned out to relieve themselves. When first brought into the home, the greyhound should be treated in a similar manner to a puppy being housebroken – taking the dog outside every couple of hours for the first week or so, especially after meals, play and long naps. It is important over the first few days to watch the greyhound closely when it is inside your house, so that you may correct it immediately if it tries to go to the toilet. When catching the dog in the act, say a firm NO and immediately take the dog outside. When it then continues to go to the toilet outside, praise the dog profusely. Do not tell the dog off if it has an accident inside but you are not there to catch it in time. Correcting the dog after the event will only serve to confuse and frighten the dog – corrections must be made at the time of the discretion, and not afterwards. Greyhounds are great with children that know how to respect dogs. The nature of the greyhound breed means that they are relatively tolerant and accepting dogs, such as having children playing with them, but this should not be taken for granted and children should never be left unsupervised around the dog. We recommend, as with all dogs, that children are taught to respect the dog, especially around the dog’s bed, around its food and at meal time. GAP aims to ensure that all of our greyhounds are sociable with other dogs. They generally get along well with other dogs, although they may not play with them. Common sense should be exercised during the introductory period and supervised feeding is ALWAYS recommended in a multi-pet household. Throughout the foster period, your foster greyhound must be introduced to other dogs. In order to experience different living arrangements, for example living alone or with other dogs, foster dogs will be moved between foster homes accordingly. Are greyhounds good with other animals? Like all breeds, some greyhounds are more compatible with some types of animals than others. During the greyhound’s time at GAP, we try to expose them to as many different situations as possible in order to understand how each individual dog will respond. From there we are able to provide advice on the best living arrangements for each individual dog, including their compatibility with other pets. Many will learn to accept other pets if introduced slowly and carefully, always with strict supervision. Any introductions should always be carried out on lead, and with the greyhound properly muzzled, until the dog’s reactions can be assessed. Risks should never be taken with the safety of your own pets. What gender makes a better pet, male or female? Both! It depends on what kind of dog you are looking for. We tend to match greyhounds to homes based upon the individual personality of the dog and the adopter’s requirements rather than their gender. We have approximately equal numbers of males versus females that we have placed into pet homes. In terms of acquiring a second dog for your household, there is no hard and fast rule as to whether you should get a male (if you already have a female) and vice versa. We have many happy families living with two female dogs, two male dogs, one of each or an uneven mix of genders. It all just depends on the dogs’ personalities, which is why we offer all adopters a trial period before finalising any paperwork. How much should I feed my greyhound? For an average sized greyhound, it is recommended to feed a good quality dry food twice daily according to the manufacturers’ recommendations and then adjusted as required to maintain an ideal body condition. This is usually about one to two cups of biscuits. For variety and interest you can combine this with fresh meat, tinned sardines, vegetables, pasta rice and eggs. If you intend to feed a dry-food only diet, please ensure it is labelled as ‘complete’ to ensure your greyhound is getting a balanced intake of all necessary dietary requirements. More in-depth feeding suggestions can be found in our re-homing manual which will come with your greyhound. What is the average age of a greyhound at adoption and how long do they live for? Our dogs usually range from two – five years of age, however we do sometimes get puppies and older dogs into the program from time to time. The average lifespan of a greyhound is 12 – 14 years. Are there certain medical issues which greyhounds are prone to? They are quite a healthy breed with very few inherited health conditions due to centuries of selective breeding. As a large breed dog, many of the medical problems such as hip dysplasia that are quite common in dogs of the same size do not commonly occur in greyhounds. As a breed, they can have sensitivities to anaesthetics so it is best to take them to a vet that has greyhound experience if an anaesthetic is required or greyhound-specific condition is present. Other ailments found in this breed include minor digestion related conditions, bloat and Pannus (an eye condition which is easily controlled with daily drops). What are the adoption fees and what is included? The adoption fee for all of our greyhounds is $350 which includes a dog that is vet-checked, vaccinated, microchipped, de-sexed and intestinally wormed. All greyhounds that are rehomed via GAP have been through the National Temperament Assessment and therefore have been issues with a Green Collar. A Green Collar means that the greyhound is able to be un-muzzled in public areas. GAP also provides all adopted greyhounds with a lead and muzzle (in case there are situations where you’d prefer to use a muzzle, for example introducing your greyhound to other animals). What is the National Temperament Assessment? Sorry, nothing was found containing your search term. Please widen your search or contact us direct, we are always happy to answer any questions you have.